Nashville International Airport Parking Your car can pay for your parking space. Nashville International Airport Parking : Nashville International Airport is one of the fast-rising airports regarding passenger enplanements in the United States of America. Having shown an 11.2 percent increase in airport operations and passenger traffic, BNA received an award from anna.aero company. In this regard, parking at the airport can be nightmarish. TravelCar has a parking solution for travelers, cost-effective parking packages. This is what you need to do, log on to www.travelcar.com and book to get these awesome deals. Nashville International Airport is situated in Nashville, State of Tennessee. Formerly known as Berry Filed, the airport was constructed in the year 1937. The airport serves both military and public uses. Nashville International Airport covers 3,900 acres of land. The airport has four runways, one primary terminal with four concourses and 44 functioning gates. The Robert C. H. Mathews Jr. Terminal has three stories. The Metropolitan Government of Nashville and Davidson County own Nashville International Airport. The Metropolitan Nashville Authority is charged with the mandate of operating the airport. BNA is a focus city of Southwest Airlines. Nashville International Airport is the 32nd busiest airport in the United States of America. In 2017, the airport had facilitated 198,750 aircraft operations and 14,134,448 passengers. Sixteen airlines are currently operating at the airport. BNA is a focus city for Southwest Airlines and the host of Berry Field Air National Guard Base. Major airports near Nashville International Airport include Huntsville International Airport, Chattanooga Metropolitan Airport, Northwest Alabama Regional Airport, Evansville Regional Airport, Barkley Regional Airport, McKellar-Sipes Regional Airport, and Owensboro-Daviess County Regional Airport. Nashville International Airport is currently the busiest airport in the State of Tennessee. This parking garage has 1,230 parking spaces. BNA Express Park is based at 115 Knapp Boulevard near Donelson Pike. Long Term B Parking Garage has 2,124 parking slots. The Economy Garage has 3,625 parking spaces. It is accessible via the Donelson Pike. 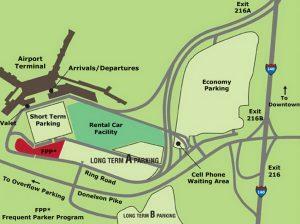 The parking lot is a ten-minute drive from the airport terminal using the airport shuttles. Please note that the shuttle service is frequent and attracts regular fees. The Short-term Parking Garage has three parking levels. Nashville International Airport has two free Cell Phone Waiting Areas. Valet parking services are available at the Ground Transportation Level. Valet parking comes at a cost. You will be required to leave your vehicle with a valet attendant at the curbside. TravelCar has the most cost-effective parking packages for any traveler using the Nashville International Airport. Nashville has been accredited for being the fastest growing airport in the United States of America. You can, therefore, imagine the influx of people and vehicles into the airport. That is why TravelCar has deemed fit to offer all travelers cost-effective parking packages to allow them to access good parking slots near the airport terminals. 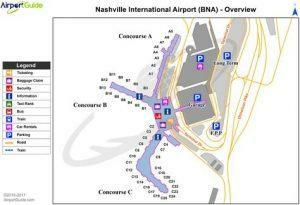 We understand the hustle and bustle of busy airports like Nashville International Airport. We also know that other parking arrangements may strain a traveler with a strict financial budget. In that case, we have a lovely discount on parking prices if you make your bookings early on our website www.travelcar.com. The most comforting bit is that we are not only available at the airport, but you can also get us to major cities, airports, seaports and at rail stations. We offer cheap parking plus have car rentals that you can lease to drive yourself to any of your desired destinations. Below is a breakdown of areas you can access TravelCar services. Grab a decent meal and relax at these hotels that are located a few miles from Nashville International Airport. As a frequent traveler in busy airports, you can relate to the heavy traffic to and from airports. You just drove yourself many miles and don’t have the time or the energy to find a parking space? Rest easy as a member of our valet team aids you with parking of your automobile. Note that you do not have a guarantee of smooth parking in the airport at any time. You may encounter heavy traffic along the way and difficulty in locating a suitable parking slot. To save you all the trouble, we have a valet team standby, to see to it that your car is smoothly parked and availed to you when you need it. Our customer service team is packed with professionals and tech-savvy individuals who can engage you on all social media platforms. We are fast and efficient in our responses. We understand the need to equip you with all the information you need before and after traveling. Our customer support channels are open 24/7 on all days of the year. You can reach us by phone on +1 888-807-0209; on our Twitter handle @Travelcar_; Facebook through the link https://www.facebook.com/TravelerCar/; website at www.travelcar.com; LinkedIn via https://www.linkedin.com/company/travelcar/; Google+ on https://plus.google.com/+Travelercar. Contact us and get guidance on how to get the cost-effective parking packages at Nashville International Airport. Road Nashville Metro Transit Authority Bus Service The MTA Bus Station at the airport is on the Ground Transportation Area on Level 1. MTA has a station downtown at Bay 13, Music City Central. The MTA bus operates on Route 18. The MTA bus connects BNA airport, Airport Marriott Hotel, Elm Hill &Acorn, Lafayette & Wharf, Music City Center and Music City Central. The bus is available to ferry passengers from Music City Central at Bay 13 to BNA airport. On weekdays, MTA bus operates from 5:15 am to 11:15 pm. On weekends and public holidays, the MTA bus runs from 6:15 am to 10:15 pm. Road Jarmon Transportation Jarmon Transportation is available at the first level of the airport. The shuttle service connects Nashville International Airport with the West End area, Downtown Nashville, Clarksville/Ft. Campbell. The shuttles are available daily. If you are driving from the West and Downtown Nashville, use Interstate-40 Eastbound and proceed to Exit 216A. For travelers on the East side, drive on Interstate-40 Westbound, Donelson Pike Southbound to Exit 216A. The driving directions from the South are Interstate-24 Westbound, Interstate-40 Eastbound and then to Exit 21A. You can also drive along Interstate-65 Northbound, proceed to Interstate-440 Eastbound, Interstate-40 Eastbound and after that to Exit 216A. The driving directions from the North are as follows: drive on Interstate-65 Southbound to Interstate-40 Eastbound and head to Exit 216A. Another alternative is taking Interstate-24 Eastbound to Interstate-65. Head to the South to reach Interstate-40. Drive Eastbound from Interstate-40 to Exit 216A. Interstate-40 Westbound to Points West and Downtown Nashville. Interstate-40 Eastbound or Donelson Pike North and Exit 216C to the East. Nashville is the second biggest city in music production after New York. It is a city worth visiting by artists and any other person interested in the music industry. Hire a car rental and move around freely in Nashville to savor all the goodness the city has to offer. Keep in mind that if you need cost-effective parking packages, look no further than TravelCar. We will always be at your service.